Creativity makes us feel active and alive and the more creativity we practice the more active and alive we feel. This intrigued someone who founded Pencils for Africa (as well as The Brick Project), to think about pencils, and to start a scheme to send used pencils to children in Africa… The Brick Project founder, might never have been receptive to the essay I, Pencil, had he not written a poem about a dustbin in Mr. Baird’s class at Chiswick and Bedford Park Preparatory School in London, UK at the age of 7 when had recently arrived from Kenya. The following is an interview with Karim Ajania (pictured at right, when Karim first started school). Karim wrote the majority of pencil articles on this Pencils for Africa site. These include The Pencil Maker based upon his experiences teaching wildlife conservation to Maasai children in Kenya; as well as The Pencil Tree which is written in the Indian folk tradition of Classical Sanskrit Literature which Karim studied at Harvard University. Olivia: I recall that I first contacted you after reading the JOQ (Just One Question) you conducted with Terese Capucilli, a faculty member at the Julliard School in New York City. I was of course fascinated by this article because like Terese, I myself am a dancer and a dance teacher. For me to read that Terese had danced with Mikhail Baryshnikov and Rudolph Nureyev, and had such a stellar career was incredibly inspiring! Karim: The problem with needing to be challenged as a writer. You see, when a writer has a fascinating subject to feature you can feel a little fraudulent because you are relying on the powerful subject matter – in this case the magnificent Terese – to tell your story for you. I had just had two such interviews in succession: The interview previous to Terese was with Janet Echelman who I had also known in the late 1980’s when we were classmates at Harvard. What Janet and Terese both have in common is that they are extravagantly talented and abundantly accomplished and prolific. In a way, that presents a creative handicap when I write about them because I can’t go wrong. I cannot fail. Even if I write a really bad article lots of people will still read it because the subject matter is so compelling. Olivia: Yes, taking out the garbage definitely keeps you grounded and clear-headed. Karim: A core component of the work being done with Pencils for Africa is environmental. 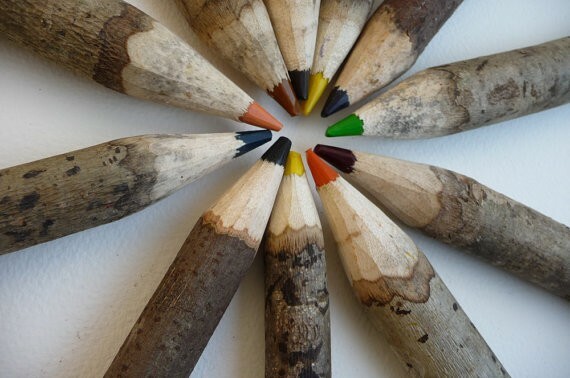 On an operational and functional level, this is a ‘recycling‘ initiative because you are recycling used pencils into creative, literary and numerical utility. It is an efficient use of waste resources. Karim: “Constant practice devoted to one subject will prevail over intelligence and skill“.